Here's a super-simple cake that's perfect for a birthday celebration, or any other celebration for that matter! 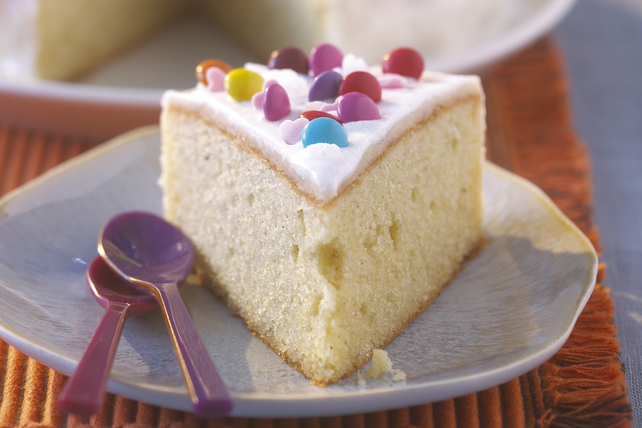 This easy recipe starts with a fluffy white cake made with a boxed cake mix that is then topped with a silky cream cheese frosting, and decorated with candy-coated chocolate pieces and sprinkles. Bake 33 to 35 min. or until toothpick inserted in centre comes out clean. Cool cake in pan 15 min. Remove from pan to wire rack; cool completely. Beat cream cheese and butter in large bowl with mixer until blended. Gradually beat in icing sugar until well blended; spread onto top of cake. Prepare using whatever fun sprinkles you have on hand, or wish to use to fit your party theme.